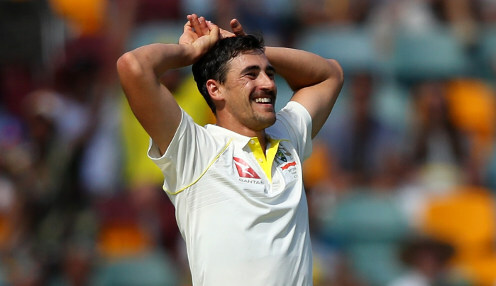 Starc, who has been out for three months with a pectoral muscle injury, is on track to be fit for the tournament in England and Wales. Behrendorff doesn't see himself as being injury cover for Starc, who will be going into his second consecutive World Cup after being part of the team that won on home soil in 2015. And he sees no reason why selectors shouldn't include both in their attack - something they did in the last tournament when Mitchell Johnson was the other left-armer. Behrendorff hasn't yet played in the same side as Starc, but said: "It's not foreign to have two left-armers in the team. Australia haven't done that a lot in the past, but I don't see why we can't do that." "Mitch bowls exceptionally well at the death, but can also bowl through the middle and up front so it might be a case of if we're both picked in the same team having slightly different roles." He added: "I'll probably look to bowl up front and Mitch might bowl more through the middle and at the end." Behrendorff has played six ODIs and has seven wickets so far at 41.42, while the southpaw marked his Indian Premier League debut with two wickets, helping Mumbai Indians beat Chennai Super Kings by 37 runs. Australia are 4/1 to win the 2019 Cricket World Cup, with New Zealand 10/1.